Jason Luthor's The Dream Map is an ambitious undertaking - a first book and a fantasy adventure at that. I read it with some trepidation. After a few pages, well... I was riding the story. I love fantasy. "I'm looking for maps of worlds that don't exist." The story is about a young man who didn't believe in himself, and his adventures in a land of wizards, knights and talking dragons! His journey to the magical land of LaGuna made him realize what he can do when forced to defend his friends and when faced with a responsibility bigger than himself. This book reminded me of Lord of the Rings and Harry Potter actually. I particularly liked the way the author introduced new plots just when you're about to get bored - and kept you glued to the story. 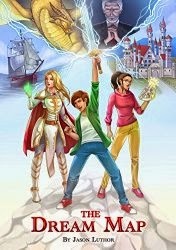 I highly recommend The Dream Map to young adults and lovers of the fantasy adventure genre.